Phil Needham was originally brought to the USA from England by a large ag-retailer, to help expand a European style crop management program. The average wheat yield in the UK is around 120 bu/ac, but some producers across the Eastern Coast of England frequently achieve 150-200 bu/ac wheat yields on their farms, using intensive management systems. This program was first introduced to producers in Kentucky where it soon had a big impact on yields. In fact, it contributed to a doubling of the average state wheat yield across Kentucky over a 20 year period. Phil now works directly with producers and dealers across the Ohio Valley, plus the Central and Northern Plains, helping them increase yields and profits using similar style intensive crop management systems. Phil conducts around 70 crop management seminars and equipment clinics each year. These events include Phil's practical experience and research, to help producers streamline their crop management strategies, increase crop yields and boost farm profits. Phil and his wife Holly started Needham Ag Technologies, LLC. in February 2006 to help provide agronomically proven products and agronomy services to fill voids in the market. Today, their equipment division continues to grow, along with their customer base across the US, Canada and many other countries around the world. 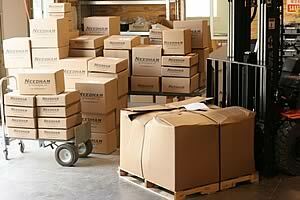 Needham Ag Technologies, LLC. uses UPS for small package shipping and Con-Way Freight for most of the larger shipments, however other shipping methods are available upon request. We regularly ship products overseas using sea and air-freight, so feel free to call for shipping quotes and transit times. 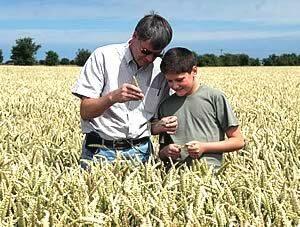 Phil Needham (left), a native of Lincolnshire, England and his son Benjamin, inspect the flag leaf of a high yielding winter wheat field close to maturity in England. 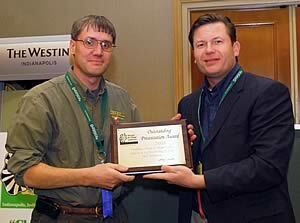 Phil Needham is awarded the outstanding presentation award by Darrell Bruggink (right) at the 2009 National No-Till Conference in Indianapolis. Phil was also presented with the same award at the National No-Till conference, following his presentations in 2008. 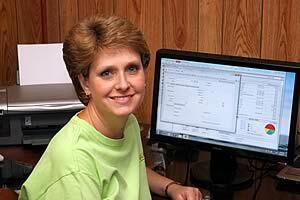 Co-owner Holly Needham, runs the office side of Needham Ag Technologies, LLC. The facility is located about 4 miles North of Calhoun, KY.
Our 10,000 sq ft warehouse facility maintains inventories of most popular products through the busy spring and fall periods.